Commemorating the brand’s 30th anniversary, White Mountain partners Greg Connors and Kevin Mancuso offer a firsthand account of how a small American manufacturer evolved into a successful worldwide sales and marketing-based sourcing operation. Left to right: Peter Fong, Greg Connors, Nick Connors and Kevin Mancuso. You know two people have been working together for a long time when they can complete each other’s thoughts almost seamlessly. It usually reflects a comfort factor, an understanding of the role each individual plays in the business and strong agreement in the corporate philosophy as well as the direction in which the company is headed. White Mountain’s Greg Connors and Kevin Mancuso, two of the four partners (with brother Nick Connors and Peter Fong) are a perfect example. When asked to reflect on their most memorable moments at the company, now celebrating its 30th year, their responses intertwine, each adding to the other’s recollection because they lived it together. Their bond is solid and it doesn’t take long to realize that Connors and Mancuso’s working relationship is also a friendship that runs deep. Connors says his most memorable moment was seeing White Mountain’s first-ever shoe go down the production line in their little factory in Lisbon, NH. Their initial styles were named after the partners’ daughter; (original partner) Frank Ferrelli’s oldest daughter, Alison, was bestowed the debut honor. Connors notes that virtually all of the components in the Alison were from vendors that extended the fledgling company credit as it struggled to get off the ground. “The design had nothing to do with what was hot in the market, it was all about what we could afford,” he says with a chuckle. But the Alison ended up doing well and kept the new company busy in its first year. Connors recalls feeling an overwhelming sense of accomplishment from building the team and getting the factory up and running. Mancuso, who joined White Mountain as a partner in 1989, recalls two milestones that happened very close together. The first was the closing of the Lisbon factory in 1994—a gut-wrenching decision, particularly for the Connors brothers who had lived in the area all of their lives and had grown up with many of the factory’s workers. However, the cost and logistics involved to manufacture shoes in the States was simply no longer viable. “The four of us thought we were going to lose our homes and everything else,” Mancuso recalls. “It was that stressful.” But better days were to come. He remembers the development of White Mountain’s Monica clog, which skyrocketed and saved the company. “It was an Italian import and it really changed our whole approach to the business,” says Mancuso, noting the timing couldn’t have been better as the partners’ backs were against the wall. “It was a near-death experience,” Connors agrees. “We couldn’t get the samples made in time,” Mancuso continues. “I was literally calling up friends in the industry and asking them to buy 4,000 to 5,000 pairs of clogs that we were going to make…” The company didn’t even have an image of the shoe to sell from, Connors adds. “We didn’t have anything and they were giving us orders, which was very gratifying.” The clog was a true overnight success and, according to Mancuso, the company soon began importing millions. Still trawling Memory Lane, Connors recalls how the two original partners—the late Ferrelli and since retired Gerry Dameshek—were integral pieces to White Mountain’s rebirth as an import-driven sales and marketing company. Connors says Dameshek, a line builder who was very dogged about interpreting new shoes, first pushed to make that clog when the rest of the partners were unaware of its potential. And Ferrelli, whose parents were first-generation Italian immigrants and therefore he spoke the language fluently, played a huge part in establishing the factory contacts. 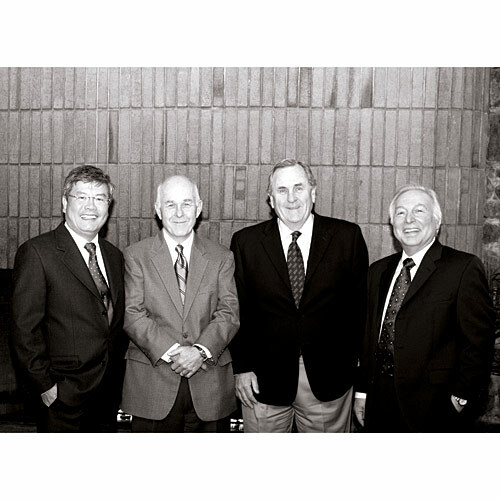 “It’s just fitting that Frank and Gerry played a very big role in the financial turnaround and how our company would be run going forward,” Connors says. Getting it done for three decades now has allowed White Mountain to significantly expand its portfolio of branded and private label and steadily grow its sales. It’s a feat easier said than done, especially taking into account the dramatic changes the industry has endured over the past three decades and the fact that so many others have failed to adapt. The proof, Connors says, occurred recently when he came across a Top 10 customer list from White Mountain’s second or third year: “None of those retailers exist today,” he reports. Thirty years ago, could you have ever envisioned how White Mountain has since evolved? Greg Connors: Our main objective back then was just to stay employed, but the odds seemed stacked against us. It was a very difficult time in the economy—interest rates and inflation were both in the double digits and credit was difficult to come by. In addition, manufacturing was on the decline, and here we were trying to start a business. In fact, we were out of work because our previous company had just closed all of its factories, putting about 600 people out of work in Lisbon, alone. Basically, we wanted to manufacture shoes and employ some of these people. While imports were certainly a part of the equation at that point, we concentrated on manufacturing and limiting ourselves to what we did well. We tried to keep the mix tight and come up with shoes that represented value to our customers. Is there anything that has remained constant in this business since you founded White Mountain? GC: The need to inspire trust with your customers and the commitment to quality and value from your employees. Those fundamentals always apply. But apart from those philosophical concepts, everything has changed about this business. Kevin Mancuso: From the four original partners to the current four, there has always been a good understanding of how shoes are made. We also have always had a good general understanding of the shoe business. Of course, the customer base and the whole environment have changed. Most of those small entrepreneurial companies did not transcend to become marketing- and sales-based import companies. While we experienced difficult times in the mid-’90s, we were able to acclimate ourselves to this new environment. A hands-on understanding of how shoes are actually made surely makes you part of a dying breed, no? GC: Yes. The next generation in the U.S. might be smart, talented and imaginative about product with respect to sales and marketing, but none have ever darkened the door of a shoe factory. KM: There’s simply no infrastructure for a young person to learn those skills today. When I first came into the shoe business, there was a thriving domestic manufacturing base. I learned the components end of the business while at Vulcan and my next stop was working for the then-largest shoe factory under one roof, Lawrence Made in Lawrence, MA. They used to make 54,000 pairs a day, and that’s where I learned shoe manufacturing. GC: This scarcity of experience is becoming true even in places like Brazil and Europe. There’s no real next generation of young shoemakers. The manufacturing has primarily concentrated in China, and that gives us all a little pause. With so much turmoil in that country, the challenge over the next six or seven years will be how to deal with those issues, because it doesn’t look like there’s a “next place” on the immediate horizon. In the 30 years that we have been in business, there has always been a next place: from New England to the southern U.S. to Europe to southeastern Brazil to northern Brazil to Taiwan to China. We have always been gypsies, and now we are moving around China—further north along the coast as well as inland north and west. Might production one day come full circle back to the U.S.? KM: I don’t see that happening. GC: It would be tough. The vibrant infrastructure that supported shoe manufacturing—the tanneries and components business—is gone. To re-create that would be very hard. There are no technicians or people with a history of working in shoe factories to even do it. So footwear companies have no choice but to try and adapt. GC: Yes. Three years ago, we were sourcing 85 to 90 percent of our product out of six or seven factories all within 45 minutes of our Dongguan office. Today, even taking into account our growth, we are sourcing from 25 factories in four different provinces and six different cities. It used to be a car ride to visit the factories; now it takes getting on a plane. It’s a lot more challenging to juggle the balls when you are diversifying so broadly. But China is a big country and has established a world-class infrastructure that, at this point, no one comes close to competing against. While each of the new factories and regions have their own quirks and differences that you must figure out, I suspect China will continue to be a viable resource for footwear and other goods. I’m amazed by your ability to continually adapt despite the remoteness or exoticness of each ‘next place’ you’ve encountered. GC: We have to. It’s one of the advantages of being a small, privately held company: We are not too hidebound to tradition and we are pretty nimble in order to stay competitive. KM: We are not the biggest company, but we are a decent size and can zig and zag as quickly as most of our competitors, if not faster. Even when we realized it was becoming more challenging to manufacture footwear in the States, we took advantage of our factory and became one of the first companies to make leather shoes in China. We utilized our sample facility in the U.S., developing the patterns and the lasts, then transferred them to mainland China. Soon after, we sent our factory superintendent to China to help us adapt further. GC: Gene Keiler was the superintendent of our New Hampshire factory 30 years ago, and 20 years ago we sent him to China on a one-way ticket (laughs). He runs our entire technical and QC operation. The average person simply has no idea of the global team of people behind the shoes they wear each day. GC: There are a lot of hands and aspects coming together to get a shoe made. It’s more complicated then people think. And today there are more challenges than ever: We now must make shoes that are free of any harmful chemicals, which really wasn’t a consideration 10 years ago. Human rights is also a big concern. It’s a big challenge to not only find factories but ones that are trying to raise the bar with respect to worker conditions and fair pay. For example, we sell to a lot of the big-box stores on a first-cost business, and Kohl’s, Sears and Target all have strict standards as to what factories qualify to make their goods. The fact that we are now concentrated more in one country makes it somewhat easier. At one point about six years ago, we were in Brazil, Italy, Eastern Europe and China, with a little bit of production happening in India and Mexico. That kind of sourcing was far more challenging and, quite frankly, dysfunctional and not at all cost effective compared to where we are now. Speaking of dysfunction, how has White Mountain performed since the financial collapse? KM: We’ve been very fortunate. While these are very challenging times for our country and the shoe industry in particular, we have had some nice growth over the past two years. To what do you attribute that success? GC: Both our brands and private label businesses feature a strong value equation. We are close to entry-level price points in each of our brands’ respective distribution channels—White Mountain at Macy’s and Rialto at Kohl’s or Shoe Carnival. That proposition has become a fairly attractive one in the marketplace of late. KM: I would agree, but we also sat down six months before the recession truly hit and proactively prepared. We took a look at the lay of the land and saw an opportunity. That’s why we started Cliffs, whereas most other companies were in a retraction mode. Granted, our existing businesses were steady and White Mountain and Rialto had opportunities for exponential growth. Nevertheless, we thought there was a void and because it was just the four of us, we made the decision quickly. We are shipping our first Cliffs shoes in July. Who is the target customer for the Cliffs brand? KM: It’s centered toward the mid-tier department stores that are a bit more price-sensitive than White Mountain’s customer base. Conversely, Rialto is more of a novelty division that can do a lot of fun items and is even more price-sensitive. Having launched White Mountain in the early ’80s recession and worked through several in the years since, how does this current one compare? GC: No recession is good, and they are generally not good for anybody’s business. What’s different today is that the world has become such a small place that is all interconnected. A country as small as Greece with its debt troubles, for example, can turn Europe upside down. The upheavals in any one place can have a ripple effect all over the world, and it’s harder to predict how the economy will react from one day to the next. Still, the heart of the problem now is unemployment. KM: Both the retailer and the consumer are still overly conscious of how they are spending, which I think is true of every recession. Do you sense any improvement yet for the industry at large? KM: I don’t know if any of the improved numbers are sales-driven. People have contracted and are still trying to save money. Now that all of the cost-saving measures have been made, we have to start looking at top-line sales for improvement. But there’s still close to 10 percent unemployment, which makes it very difficult. Are you optimistic regarding the outlook for second half of this year? KM: We are always cautiously optimistic. We have weathered previous recessions. The four of us try to be very proactive. We don’t live beyond our means and we try to keep things under control. Far too many consumers were living beyond their means, which was at the root of the problem. GC: That’s right. We watch our cash flow and bottom line very carefully and we generally don’t fall in love with inventory. We liquidate any mistakes as quickly as possible. Shoes aren’t like wine; they don’t appreciate with age. We saw a pretty good uptick in business in 2009, during which most of our product performed well. But one of our salespeople recently said he didn’t know how to behave when calling on customers anymore, because the approach for the past 20 years has been to sell from fear—like every sale was possibly his last. Now it’s a bit easier for him to get the date and commitment from his customers. I think it’s always been a part of our mindset: You have to keep running faster than the next guy. That’s how we approach our business. In what ways has your target customer changed of late? KM: They are much more selective and very price-conscious today. There are so many options for purchasing footwear today that didn’t exist before, taking into account the Internet alone. From the ability to price-compare or communicate on social media sites, retail has changed. It isn’t about just going to a department store anymore. Yet White Mountain’s business is primarily with traditional department stores. KM: That’s not going away, and those retailers are developing their own viral marketing programs. GC: A lot of our customers do a surprising amount of business on their own e-commerce sites. For example, we do a significant business with the QVC network, which is a totally different format on how product is sold, but they also do a significant part of their business via QVC.com. Some pundits say one of the biggest casualties of the recession has been the luxury tier. Would you agree? GC: People may say that, but I just came back from Europe and I can tell you that it doesn’t look like Chanel and Louis Vuitton are having a difficult time selling handbags. I believe it’s hyperbole. Consumers still appreciate and desire fashionable items. KM: Fashion trends will continue. Nevertheless, I think you have two consumers today: The people who are frugal and look for value and then those who are fashion-driven. To me, just because you are being frugal doesn’t mean you have to buy cheap. Frugal means finding the best value. And at different price points, there’s different value. That’s a segue into our company: We have always had understandable fashion at a great value. When we develop and price our shoes, we always think about the retail price points and what is going to drive our business. Any other brand launches planed for the near future? KM: Right now, we’re absorbing the Cliffs launch. And Rialto is only about four years old. We like to walk before we run, and I think there is tremendous upside in both of those divisions. Why are you so bullish—let’s face it—many others haven’t been? KM: Retailers want newness. And we’ve developed a wonderful relationship with our retail partners. I don’t mean to sound like a country bumpkin, but we have nurtured those relationships and most of our customers have a comfort factor with us. So when we launched Cliffs and told them what our objective was, we didn’t need to spend $10 million to market the brand. We pretty much pioneered it the old-fashioned way, and we’ve had a nice reception. GC: If we were a completely new company trying to promote a new concept, it would be very difficult to get traction today because of the consolidation at retail. Customers have all gotten bigger, and being a successful vendor with any of them has gotten more difficult. It’s more than just making the product and then sticking it in a box in order to sell Macy’s, QVC, DSW, Kohl’s, Target, etc. Every customer comes with a set of rules and to one degree or another they have all pushed work they used to do in their distribution centers back to the manufacturers. So being somewhat fluent in talking their language and satisfying their demands is what it takes to be in the game. If you are in the door already and have their trust, it’s easier to have them be receptive to a new idea. Might this consolidation prevent new blood from entering the industry? KM: Anyone who is creative and develops a better mousetrap will always be successful. That’s part of the American way. You just don’t have as many opportunities when you are starting out from scratch. GC: The consolidation at some point might also reinvigorate the independent retailers. In a sea of consolidation where everything starts to look a bit too much alike, there’s opportunity for a creative person to build something that will attract customers. Independents may flourish on the local, micro level, but on the macro level, I think consolidation is here to stay. As long-time industry survivors, do you have any advice for retailers? KM: Most of the time they don’t ask for my advice (laughs). GC: One of the bylaws of our partnership was that I wasn’t allowed to talk to customers (laughs). But I give advice to my brother Nick and Kevin all the time, and that’s to raise prices and sell more shoes. But I don’t think that advice reaches our retailers. KM: I think retailers today have to understand their strengths and maximize them. I also believe they should focus on their competition, so they know where they can take advantage and where they can’t. Of course, they also have to focus on their consumer and develop their own niche. But doesn’t consolidation make it more difficult to carve out a niche—for retailers and suppliers alike? KM: It does, but I think certain vendors will become more dependent on certain retailers over time. It’s already starting to happen where you have concept shops in the stores. At one time, people just made shoes. Now it’s shoes and handbags and clothing. And it’s not just couture brands doing it; mid-level brands are as well. GC: Consolidation has made it more difficult for suppliers in that retailers all demand difference from each other. The challenge for our product development teams is virtually creating an individual line for every customer. Even if you have product that is well thought-out and will potentially resonate with the consumer, you will have to change it for the next retailer. What’s new for Spring ’11? KM: I think flats are going to continue, oxfords will return in a major way, clogs are going to be very big at all levels and you’ll see a classic/vintage theme—boat shoes and styles of that ilk. At the same time, there’s still a lot of embellishment out there. If you look at White Mountain’s heritage, clogs and oxfords are right up our alley. But there’s always a new twist. Today, in addition to the traditional slip-on clog, there are clogs in all heel heights, shapes and with different types of embellishments. I watched ‘Desperately Seeking Susan’ recently and I could swear I saw some of those same shoes in showrooms a few months ago. GC: I’ll get the DVD right away… Along those lines, I was recently looking at an ad we ran with Nordstrom in a Portland, OR, newspaper from about 25 years ago. It featured three of our shoes—two wingtips and cuffed bootie. That’s what we stood for then and both of those looks are coming back. But it’s not as simple as dusting off what we did 25 years ago. Do you have a five-year plan for White Mountain? KM: Historically, we have never really looked out that far. That said, we’ll be exploring e-commerce, possibly move into accessories and obviously continue to maximize our three brands. At that point, it could be either an acquisition or developing another brand to target another segment of the marketplace. That’s pretty much where we want to be. Any desire to slow down? KM: Not at this particular time. What do you each love most about your job? GC: The challenge of staying alive and averting those near-death experiences keeps you young and fresh and your mind working. But I love the people part most—putting together the hodgepodge of people we deal with. I’m much more involved in the sourcing side and experiencing different cultures and the challenges those differences present is the most fun aspect of my job. KM: I can’t stress enough how pleased I am with the group of people who are associated with White Mountain. I think they are all a reflection of what the partners stand for. They are truly wonderful people who are extremely loyal and dedicated to our company. I also love that my job is constantly evolving, and that keeps you young, vibrant and alert. I love the challenges it brings from day to day. I believe the most awful thing for a person would be to wake up and dread heading to work. I’ve always been very grateful that I look forward to going to work each day.